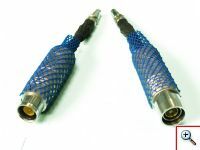 Adapts a standard Fischer Triax connection to a CamMate's Triax or Trico?BNC Connection. The kit will come with both a female and a male adapter. The female end attaches from the camera to the Triax BNC Connection on the CamMate head. The female attaches to the Triax labeled BNC connection on the backside of CamMate's electronics box. This will allow the freedom and continued use of the slipring.